The picture you see above is from Agbogloshie. You may have heard of it. 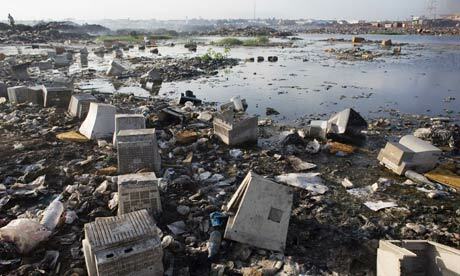 A roughly 4 square kilometer scrapyard in the heart of Accra, Ghana, where electronic waste is dumped, polluting the waterways, soil and air. Smoke rises up in the air causing sickness among those poor souls who have to earn a living from treading across the scrapyard twiddling the bits of metal apart and trying to recycle (improperly and dangerously) the e-waste into something they can sell. This is an exemplar product of our linear economy. Endlessly mining out minerals, making phones and other electronics in large share-holder owned factories under treacherous and questionable labour conditions, forcing redundancy in phones (and other electronics) for people to have their phones and laptops only a short while (buy new, buy new), and throwing them away into landfill. Creating waste. How much more efficient and sustainable could we be if we started closing the loop on this production-consumption conveyor belt? This would be an easy transition to a circular economy if we started to efficiently and humanely mine our phones and other electronic devices instead of the Earth. While we are restructuring our production and consumption globally of everything from coffee beans to tablets, we could be smarter about how we work within the current production and consumption systems. For instance, in the case of electronics, supporting small and medium businesses that take our e-waste and repurpose or (correctly) recycle them into objects and elements that can be re-used would be much, much more cost-efficient than the current and highly unsustainable linear mine-factory-shop-consumer-waste chain we are stuck to. In Namibia there are a few companies already doing this. I will mention one that I used recently. It is called "Inspired Technology" and is run by a man called Ignatious Jingura. They collect old and broken electronics for recycling and proper disposal. I found a flyer of his and kept it thinking that I will make use of it. When packing up my house preparing for my move recently, I noticed a whole box of old electronics that I do not use. Luckily I still had the flyer. So I emailed him. Immediately he responded. He would come collect it from me (at no cost to me) at a time that was convenient for me. Super responsive, super professional, and with a sound understanding of why e-waste recycling is important not only for business but also for human health and environment. These are the items he took off my hands: old cds, batteries, broken phones, cables, old laptop pieces, used and empty ink cartridges, and various other electronic bits and bobs. It was so, so easy. He told me that I should spread the word so that more people rather use e-waste recyclers rather than tossing it to landfill which was an immeasurable waste of resources and energy, never mind the polluting aspects (into the water table, our soil, etc). If we invested more in supporting small businesses like Ignatius, we would create a much more sustainable, well-distributed, and circular economy. And there are many examples like the one focusing on e-waste. For those who have e-waste (anything), I would recommend Ignatious Jingura to come take it off your hands. His number is 0816260101/0813664455, or email him at e.wasteexpert.nam@gmail.com.